Aw yeah, it’s hall bathroom time, baby. We have about five phases of updates that we plan to share as we go, so here’s phase one. We’ve been hiding something in our hall bathroom. What? You thought that giant empty frame was just there because it looked good? Nah. To better understand this skeleton in the closet atop the toilet, might I refer you to this 20-month old post by Sherry entitled “Sometimes I Go Crazy.” It’s about how Sherry got a wild hair and busted out one of several extraneous towel bars that were un-centered/overkill/everywhere in our hall bathroom. 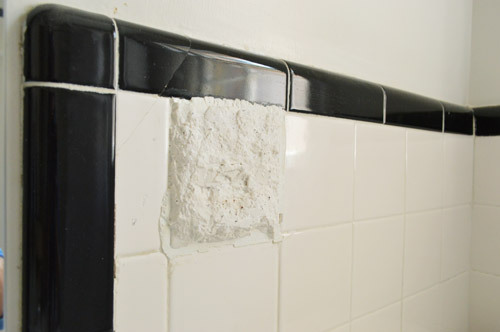 Thankfully we were able to cover up the resulting tile scab with some new trim, so we considered it a success. Not quite so successful? Sherry’s attempt to bust out a weird soap dish above the toilet. So we’ve been living with this craggy eyesore for nearly two years, shrugging it off as “oh, we’ll just dremel out a tile or two and replace them someday” (like we did here). But then we came up with a better idea – something that would be functional and decorative – and cover that lumpy mess. A chunky floating shelf (to rest art, cute toiletries, etc). See, form + function + ugliness shroud = awesome. Note: we somehow accidentally deleted a few of the early photos of this project, so bear with me as I try to explain this somewhat logically. I know, I know. Deleted photos? That’s like a class 1 blogging misdemeanor. Tell it to the judge. Anyways, covering up the existing damage involved making some more. This time in the form of pilot holes to help us hang our homemade shelf. We decided to create a chunky, shallow shelf that was built following a plan similar to what Ana White shared on our blog for recreating the floating shelves in our old dining room. It involved building a “sleeve” over which a box (aka, the shelf) can rest and therefore appear to float on the wall. Since our shelf wasn’t going to hold much weight, I made mine much less heavy duty than Ana’s plans called for. Here’s the shelf itself. 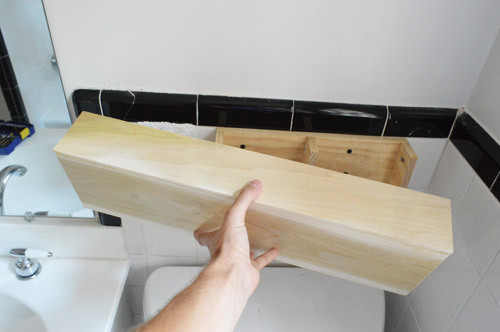 It was made from some simple craft pine from Home Depot. It was eight bucks total for the wood (the top was a thin piece of wood that was leftover from Clara’s dollhouse). But you can see that I just used the Kreg Jig to make a flat plank with wood pieces shooting out as the “sleeve” (which I drilled into the tile and secured using a masonry bit) and the box was just made like you’d make a box (again with the jig). As for the measurements, it’s 6″ tall, 21″ long, and 3″ deep. I didn’t put a bottom on it since you’d never see that side of it… unless you were actually inside of the toilet tank. And if that’s your view, you’ve got far worse problems than seeing the underside of our shelf. So here you can see how it the shelf box fits nicely over the “sleeve” AND completely covers up the ugly, busted up tile. Plus, this $30 fish print that Sherry snagged from Joss & Main is a nice shot of color too. Thank goodness it now has a spot to rest! 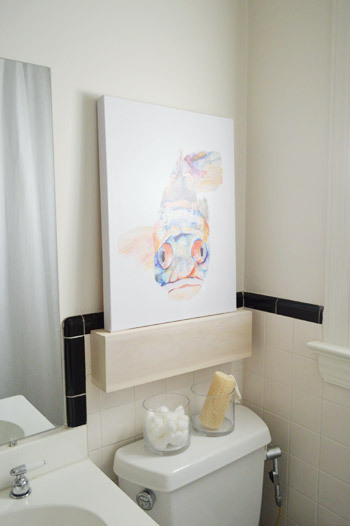 It’s actually a great height with the mirror, so it looks nice and balanced – like Bubbles (that’s the fish’s name) was meant to be. 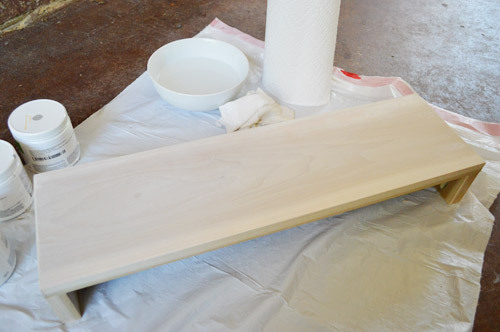 We went back and forth about whether to paint or stain the shelf and, if so, what color to pick. Not knowing yet what color the walls would be we didn’t want to go too bold (we have big plans for a pretty bright window shade along with other colorful accessories like the fish art). So Sherry concocted a plan to whitewash it by dampening the whole piece with water first (just so the paint would glide on better) and then wiping some liiight gray paint over it with a paper towel (the color was Collingwood by Benjamin Moore – we had a test pot leftover from this project). She just smeared it around until it was her desired lightness and all pretty much the same tone (not blotchy or darker in some areas). Here’s the result. We liked that it still had some of that wood grain texture, but wasn’t as orange as it was originally (the orange tones looked weird in our black and white bathroom- didn’t want to go Halloween with it, ya know?). Happily, this little homemade shelf is much better solution for us – especially since it is far more functional than the soapdish was to us (have you ever noticed that toothbrushes of today don’t even fit in them?). And after having done this, I think it’s the push we need to finally put some paint on those walls (spoiler alert, we’ve already started!). And I promise to keep better tabs on the photos. Promise. And if the old shelf ones turn up I’ll add them into this post retroactively! Until then, it’s just a fish on a shelf hiding some broken old tile. Haha. Just a normal day at our house. What did you guys do this weekend? Any cover ups going on? Psst- Being in NY, CT, and NJ for the past few days, we witnessed the damage of Sandy firsthand – it’s bad up there guys! Sherry’s grandma still doesn’t have heat or power, there’s hardly any gas to be had, and most people along the coast were hit the hardest (her brother lives in Jersey City and the first floor of his apartment flooded). We’re sending lots of love to everyone up there and will definitely be sharing more when we post a tour update at the end of this week. I had no idea they sold craft pine – that’s awesome. I love the shelf+leaning art combo! How is it that our projects line up? And when did you have time to do this with your 16 hours of driving this weekend? We are in the process of covering up…basically our entire bathroom. Walls, vanity, floor, everything. Wagner Bathroom Lipstick Project 2012. Whatwhatttt! Haha! We have been stocking up projects to share while we travel so we actually did this a few days before we left! Hall bathroom time!!!!!! You had me at “bold color on the wall” Can’t wait! You guys are so clever! The shelf looks like it was meant to be there. The whitewash is a great call by Sherry. It really ties the whole thing together. Another job well done! Love the cover up! Such a smart and simple idea. Looks great! 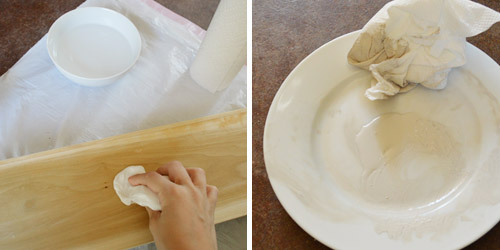 :) Love that white wash. I just wanted to let you know that I spent all day yesterday immersed in your book. Great job y’all. That is a great simple idea. Looks great! I would just try to do things one phase at a time. 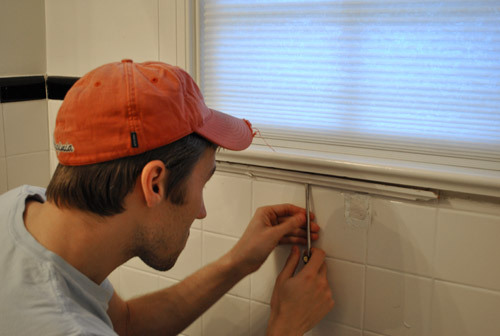 Instead of removing the toilet and shower all at once, try removing the toilet, redoing the floor, and if possible installing the toilet again asap. Then you can move on to the shower area. Might be hard though (we were without a shower for a while so we showered at John’s sister’s house and the gym). I’m starting on my bathroom this week, too! What a great idea! I have some of that same tile in our ranch house’s bathroom. What’s up with their fascination of putting those holders in there? They are useless now. This may just change all of that now! Thanks for sharing! Totally unrelated to the bathroom shelf….your book was shipped to me on Saturday!! I put the baby down for a nap that acternoon & read the entire thing in one sitting :) great job! Loved it! It was just the nudge i needed to get geared up to tackle the kitchen this winter! I love a good “cover up” project :) I’m glad you guys were able to come up with something that worked out so well! Your book should arrive at my house today! I.AM.SO.EXCITED!!! I am also planning to go to Chicago on Saturday for your book signing at West Elm. I am from Grand Rapids, MI which is about 3-4 hours (depending on traffic) away from Chicago. Any tips on what time I should get there to get in line? I know the event starts at 1, but how early have people started lining up at your previous events? Thanks! Can’t wait to meet you both! I would get there a little early if you can, come with a full belly wearing something warm in case you’re outside for part of the line, and not bring any kiddos that can’t handle a wait (a tween with a Gameboy might fare better than a restless toddler- Clara could never had made the long wait). Oh and carpooling if you can (or taking mass transit helps) since parking might be hard at certain places. Hope it helps! Generally everyone has lots of fun in line and makes friends and it’s a huge lovefest!! Wahoo. Best readers ever. FWIW, I called West Elm-Chicago this morning – they seemed very eager to try and help as much as possible. That said….they advised getting there as early as possible. The store will open at 10:00 am Central and she said people have already told her they’re planning on hanging out in the parking lot prior to opening. It sounded to me as though they’re hoping to snake people around the store as much as possible, to keep everyone out of the elements. I’m planning on taking the 7:00 am train from Glen Ellyn, cab from Olgivie and hopefully be at West Elm around 8:00 or 8:15 am. Good news is that the extended forecast says it may be around 60 on Saturday (which beats the 20 this morning). The manager did say the event has been far more popular than they anticipated, and they’re still working on plans to make it work for as many people as possible. I got the feeling that it may be a book signing only, just due to the number of potential participants (which is still neat, but I would have loved to have heard the talk – but I think they’d have to move you to the Chicago Theater at the very least to accommodate the crowds). And, pretty much a first come, first served event. If you’re worried about buying a book on site, she did actually take my name to put a book aside (I just got my Amazon copy, but wanted to support West Elm as well). Oh, she said they still have plans for hot drinks and cookies! The manager really did sound very very nice – and really trying hard to make the event work. And, definitely, if you can – mass transit is the way to go in that neigborhood. IIRC, it’s near the North and Clybourn stop on the Red line. Aw, that sounds so nice! I’m so glad they’re being so friendly and working so hard to make it work. They have been amazing! We’re so happy they’re supporting us on our tour! We are going to west elm in Chicago too. They said it was first come first serve when my friend called the store and to get there early. They closed the RSVPs because there were so many responses! Ack! We can’t wait to see you guys! We’ll do as much as humanly possible to meet every last one of ya! We love you guys for coming out!! Will you be ending at 3:00 if people are still in line? Or will you try to stay as long as it takes to get people thru? Just wondering what to expect. Thanks everyone for the advice. I am totally unfamiliar with the area. When we go to Chicago we usually stay near the Michigan ave/Millenium Park area. How far would it be to park in that part of town and take a cab to West Elm? Oh yes, we have been known to skip meals and stay hours late whenever we can! We don’t have our flight schedule, but as long as we don’t miss our flight home we can stay as late as possible! We can’t wait to meet you all. As for your questions about the area, does anyone local have info for Danielle? Danielle, I’d think a cab would be about $20 or so from Millenium Park…but if you’re at a hotel, ask the doorman or concierge for an estimate. You’re going to North and Sheffield (1000 West North Avenue) – pretty much the DePaul area (and not that horribly far from Steppenwolf if you’ve been there). You could do the Red Line and get off at North and Clybourn and walk a few blocks (at least that’s what the West Elm website says) but I know I’m going to treat myself and take a cab from Randolph and Clinton. Hopefully someone from the DePaul/Lincoln Park area will chime in. It’s a nice area, lots of fun shopping is what I’ve been told. What can I say – I’m one of the oldie 3% who’s more familiar with the Oak Brook location. Danielle – your best bet to get to West Elm is to just take the Red Line subway from downtown to the North & Clybourn stop. If you take a cab, it will cost at least $20 because traffic is a nightmare in that area on the weekends. Cheapest parking downtown is in the South Loop (Harrison & State, across from the Red Line stop would run you about $8-12 for the whole day of parking). From the North & Clybourn stop, you just go out, make a left to walk west on North Avenue and WestElm will be in a shopping center about two blocks away on your right. It’s a 3-5 minute walk. Sandy did horrible damage. We donated to the Red Cross, Salvation Army and in honor of our dog, the Humane Society over the weekend. I encourage all the faithful readers of this awesome blog to do the same. We are so lucky to have our homes intact. Thank you. A good reminder Theresa. We are on the shore in CT. Not the damage of NJ and NY but it sure was a scary and destructive storm. Sure puts things in perspective doesn’t it? Cute! I’ve been wondering what was going in your hall bath (so stalker-y) since…your day in the life post? Something like that. Nice! I wanted more info about how the shelf attaches to the sleeve so I followed your link to the dining room project and noticed the link to Ana’s blog there is outdated and doesn’t redirect like it should. You may want to update that. Amazon should be delivering your book to me today!! Thanks so much for the tip Anne! Off to fix that! Thinking of everyone affected by the hurricane! Neat shelf! And I love that little fish! Since we’re in the planning/pricing/designing phase of our bathroom remodel right now, I can’t wait to see more of your bathroom updates! BTW, Bubbles is adorable! Somehow I always seem to miss the best stuff on Joss and Main. I keep an eye out for the cheap stuff! Haha! He’s a big canvas so for $30 I was like “sold!” – the colors in the art are going to inspire the rest of the room! So excited. That’s so exciting that you’re tackling the bathroom! I can’t wait to see what you have in store. 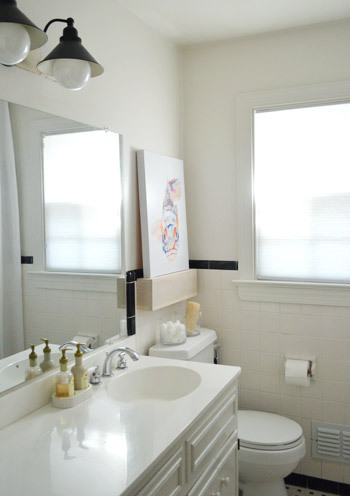 I like the simple cover up and can’t wait to see plans for this room unfold! The shelf is a great solution! Who wants to store their toothbrush right above a toilet anyways? Please tell me I’m not the only one sleeved out about that. I keep the seat closed for fear that my toothbrush will accidentally fall in even though it’s as far as possible from the toilet, lol. Can’t wait to see the rest of your plans for the bathroom! Funnily enough, I actually tried to see if a popular ikea table would fit in our bathroom as chunky shelves! 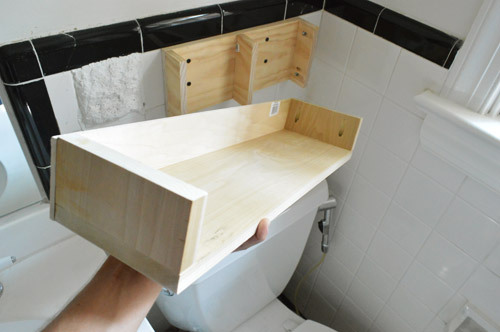 ;) Your shelves are much better than a soap/toothbrush dish over a toilet – why would anyone do that?? Is that fish from J&M – I’ve seen a fish on there like that and wanted it bad everytime! P.S. I posted about your book event in Wilton – I think our pictured turned out pretty good! Ahhhh! It was so much fun to meet you, and the pic idea = hilarious. Love it!! Sorry – I just realized I skipped the paragraph that says where you got it. I spent the weekend recovering from wisdom-tooth removal. So basically on a couch, eating ice cream & mac and cheese. :) I’m back at work today but don’t want to be. I can’t wait to see you guys in Boston on Wednesday! Hopefully I don’t faint from antibiotic induced nauseous. THAT would be awkward. Aw, so excited to see you! I’m on antibiotics too (kidney infection, ack!) so we can be awkward together! Haha. I love the fish painting! You guys are seriously the best finders-of-awesome-accessories ever. The shelf looks great! I love the art print, too! This weekend I spent hours going thru your book! http://mailboxjourney.com/2012/11/05/i-dream-about-wreaths/ It came in the mail on Saturday. It’s amazing, great job guys! It was completely crazy to see your faces all through-out, so I can’t even imagine how you guys feel when you looked thru it for the first time! Aw, you’re so sweet Melanie! So glad you loved it. Whew! Like the shelf! It covers the problem area yet provides a functional place to display art. Always love an art ledge! 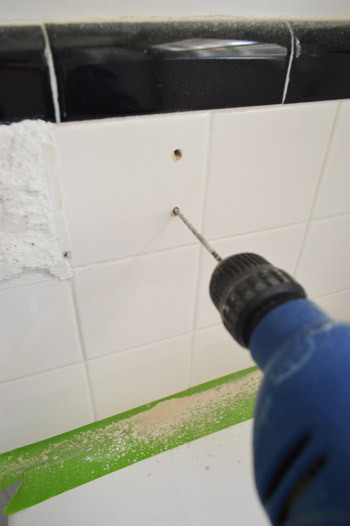 What is your technique for drilling through tile? What type of drill bit do you use? 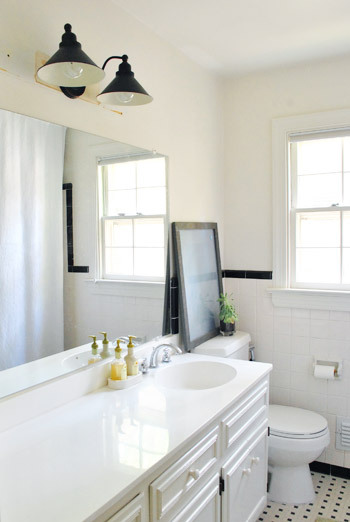 Can’t wait to see your Bold Bathroom Beautification! 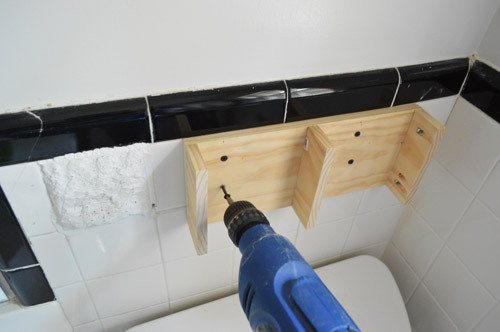 We use a masonry drill bit with a regular drill (it attaches right in- so handy and only a few bucks). Can’t wait to see what color you go with in the bathroom!! Also, thanks for the link to the Ana White post — that project looks SO easy and doable, even for total novices like us!! So unrelated to this post…I was sooo excited to see your book on my doorstep this past Friday. I couldn’t put it down all weekend! Seriously, you guys are brilliant! There are so many great projects I need to try. And I am definitely buying this book for my sister and mom for Christmas. I love that all of your ideas are relatively inexpensive, don’t require too much skill, and are totally unique and creative. Seriously, you exceeded my expectations! Thank you! Aw thanks so much Laura! You have no idea how great that is to hear! Oooh I’m excited to see what you guys think up! I love it when y’all start to tackle a new room! I bought my husband a Kreg Jig for father’s day, but he hasn’t gotten it out of the box yet. This would be a good project to get his feet wet (and get me a new shelf). white washed doors last night and was debating if they were cool – now that i see you white washed something, i can let out a sigh of relief! Picked up your book today! We just moved into a new apartment so I am so excited to see what me and the hubs can do to improve our new place. 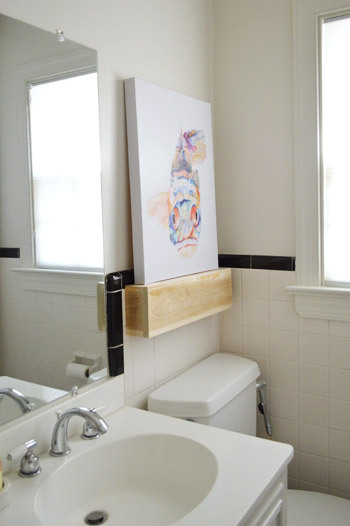 Our bathroom needs TONS of work…..so maybe this will make it into the mix! Aw thanks so much Mary! Hope you love it. I like the shelf- can’t wait to see what color you choose! I had sympathy pains for you in this post. D: How many bad words were uttered or pens thrown when you realized you deleted those photos? Oh yeah, there were some audible groans. Hahaha. John was saying it would be cool to print some old weathered letters on it like an old box, but we’re going to wait for the rest of the room to come together to make sure after we add patterned fabric and colors on the wall and new hardware/accessories it’s not all too busy. Glad you guys were able to see the damage first hand in Jersey. We have family in Rumson and they were telling us how Sea Bright and Sandy Hook are practically gone. My heart just breaks for everyone. We have friends and family in NYC as well and I just can’t imagine what they’re all going through. Thanks for sharing! Thank you for this post! We just purchased a house with four bathrooms – all with toothbrush holders and soap dishes. 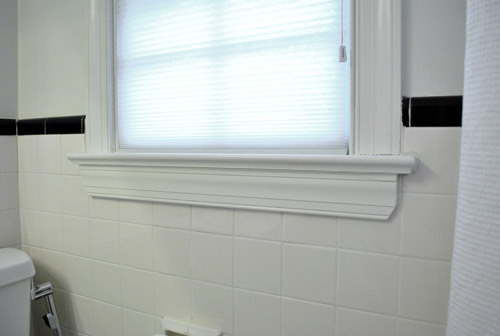 One bath has FOUR towel bars running the length of the room. And of course, all of these items are in random locations! Floating shelves are a fantastic idea. Just wanted to stop in say that I can blame you both for my unproductive weekend. Your book arrived in my mailbox on Saturday morning ;). As an avid reader of your blog, I have to admit I was somewhat expecting it to be a little redundant despite you saying that they were all new ideas. And I was totally okay with that. However, you did an AWESOME job of bringing us totally new and fresh ideas. Thank you, thank you! Wahooooo! You’re so sweet and I’m so glad!! Our bathroom is on the agenda for over Christmas break so it will be great to see your transformation as we plan ours! Our bathroom is a full gut though…orange and gold sparkly floors, a peach tub, and brown ivory swirl plastic tile. Agh. The soap dish and towel bar near the toilet sounds like what they have in Europe next to bidets. Except that’s not a bidet haha. Maybe they also had a sprayer! Were some previous owners European? Haha, I don’t think so, I think they’re born and raised in VA! Ooh beadboard sounds awesome! Or you could make some wainscoting (tutorials for that are on pinterest) or even use decorative tin from a home improvement store (we’ve seen it as a killer backsplash). Oh, and the shelf looks great! Nice upgrade! Perfect easy solution to the prob. I am sure you guys are going to post more info later in the week – but for the Richmond event on Thursday, will there be books there to purchase or do I need to bring one for signing? Books will be sold at every event (and the folks hosting each one appreciate if you buy one from them if possible) but of course you can bring one too if you’d like! Wahoo! I love that fix. It looks great and is so functional! Yay. That print looks amazing – any chance we can get a close-up of Bubbles? P.S. I am anxiously awaiting the arrival of the UPS man at my door, with your book. I had a mini heart attack this weekend when UPS updated my tracking information with “Network disruption due to prior weather conditions”. But this morning when I checked it said “Out for delivery”. Fingers crossed that the UPS guy gets here before his normal 6pm. Although, at least I’ll get some work done if your book arrives after the work day ends. Ahhhh- that’s so exciting! And I’ll have to get a close up for Bubbles for you! True story…when my daughter was about 2 my husband came home with a Beta fish for her. When I asked her what it’s name should be she, without hesitation, said “how about Bubbles!” It’s the perfect fish name! So, funny soap dish story, we had one of those floating soap dish/toothbrush holders in our bathroom growing up, until my brother put his new toothbrush in it and couldn’t get it out. His solution? Stand on the toothbrush and try to push it all the way through the holder. (ah the mind of an adolescent male). Ergo, no more soapdish, and my dad replaced it with non-matching tile because the style in the bathroom had been discontinued. Your hall bathroom is head and shoulders above the one I grew up in! Hahahahahhah- that’s a hilarious story! What Rebekah does not remember is that her father had already replaced the toothbrush holder right after we moved in. The previous owners had managed to break the holder between walk-thru and moving out.